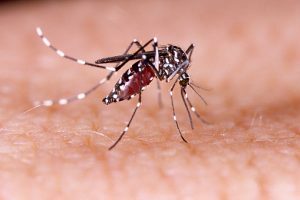 If your yard and outdoor space has become a haven for mosquitoes and ticks, and you need the best in Fairfax VA mosquito control companies, try calling the pros at Complete Lawn Service. Complete Lawn offers total lawn care and landscaping services to homeowners throughout northern Virginia. We’ve been helping beautify landscapes since 1972, and we are dedicated to keeping Fairfax lawns healthy year-round. In our mid-Atlantic region, the often warm and humid climate is very conducive to mosquitoes. Recently, a major pest control entity ranked the D.C. region among the top 20 cities for mosquito problems. And in addition to the nuisance of mosquito and tick bites, these bugs can also be carriers of Lyme disease and other potentially serious ailments. At Complete Lawn, we have a mosquito control process that is ongoing throughout the spring and summer. We employ trained professionals to inspect your property and recommend steps to reduce insects. We apply a specific BT product to any standing water areas and spray the perimeter around your property, focusing on popular spots where insects gather such as underneath decks. We’ll keep a glue card on your property afterward to monitor insect activity. Our process keeps your lawn mosquito and tick free without the use of poisonous chemicals that cause health risks. We use sprays and other products that are composed of natural, environmentally friendly materials. Our sprays are safe enough that you and your family and pets can use the property immediately after spraying. And our programs are fully guaranteed…if you have any problems afterward, you can call us within five days for a property re-spray. Get rid of the pesky mosquitoes around your home. Contact Complete Lawn today for a price and to find out more about what makes us the preferred choice in Fairfax VA mosquito control companies. We’ll keep your lawn healthy, green and safe.